An electric vehicle, also called an EV, uses one or more electric motors or traction motors for propulsion. An electric vehicle may be powered through a collector system by electricity from off-vehicle sources, or may be self-contained with a battery, solar panels or an electric generator to convert fuel to electricity. EVs include, but are not limited to, road and rail vehicles, surface and underwater vessels, electric aircraft and electric spacecraft. The electric, solar-powered aircraft, Solar Impulse 2 successfully circumnavigated the globe. A Spanish made electric scooter, Torrot Muvi. EVs first came into existence in the mid-19th century, when electricity was among the preferred methods for motor vehicle propulsion, providing a level of comfort and ease of operation that could not be achieved by the gasoline cars of the time. Modern internal combustion engines have been the dominant propulsion method for motor vehicles for almost 100 years, but electric power has remained commonplace in other vehicle types, such as trains and smaller vehicles of all types. In the 21st century, EVs saw a resurgence due to technological developments, and an increased focus on renewable energy. A great deal of demand for electric vehicles developed and a small core of do-it-yourself (DIY) engineers began sharing technical details for doing electric vehicle conversions. Government incentives to increase adoptions were introduced, including in the United States and the European Union. Electric vehicles are expected to increase from 2% of global share in 2016 to 22% in 2030. Electric motive power started in 1827, when Hungarian priest Ányos Jedlik built the first crude but viable electric motor, provided with stator, rotor and commutator, and the year after he used it to power a tiny car. A few years later, in 1835, professor Sibrandus Stratingh of the University of Groningen, the Netherlands, built a small-scale electric car, and between 1832 and 1839 (the exact year is uncertain), Robert Anderson of Scotland invented the first crude electric carriage, powered by non-rechargeable primary cells. Around the same period, early experimental electrical cars were moving on rails, too. American blacksmith and inventor Thomas Davenport built a toy electric locomotive, powered by a primitive electric motor, in 1835. In 1838, a Scotsman named Robert Davidson built an electric locomotive that attained a speed of four miles per hour (6 km/h). In England a patent was granted in 1840 for the use of rails as conductors of electric current, and similar American patents were issued to Lilley and Colten in 1847. Due to the limitations of storage batteries at that time, electric cars did not gain much popularity, however electric trains gained immense popularity due to their economies and fast speeds achievable. By the 20th century, electric rail transport became commonplace. Over time their general-purpose commercial use reduced to specialist roles, as platform trucks, forklift trucks, ambulances, tow tractors and urban delivery vehicles, such as the iconic British milk float; for most of the 20th century, the UK was the world's largest user of electric road vehicles. Electrified trains were used for coal transport, as the motors did not use precious oxygen in the mines. Switzerland's lack of natural fossil resources forced the rapid electrification of their rail network. One of the earliest rechargeable batteries - the nickel-iron battery - was favored by Edison for use in electric cars. EVs were among the earliest automobiles, and before the preeminence of light, powerful internal combustion engines, electric automobiles held many vehicle land speed and distance records in the early 1900s. They were produced by Baker Electric, Columbia Electric, Detroit Electric, and others, and at one point in history out-sold gasoline-powered vehicles. In fact, in 1900, 28 percent of the cars on the road in the USA were electric. 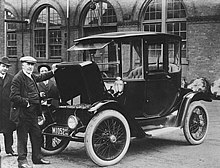 EVs were so popular that even President Woodrow Wilson and his secret service agents toured Washington, DC, in their Milburn Electrics, which covered 60–70 mi (100–110 km) per charge. A number of developments contributed to decline of electric cars. Improved road infrastructure required a greater range than that offered by electric cars, and the discovery of large reserves of petroleum in Texas, Oklahoma, and California led to the wide availability of affordable gasoline/petrol, making internal combustion powered cars cheaper to operate over long distances. Also internal combustion powered cars became ever easier to operate thanks to the invention of the electric starter by Charles Kettering in 1912, which eliminated the need of a hand crank for starting a gasoline engine, and the noise emitted by ICE cars became more bearable thanks to the use of the muffler, which Hiram Percy Maxim had invented in 1897. As roads were improved outside urban areas electric vehicle range could not compete with the ICE. Finally, the initiation of mass production of gasoline-powered vehicles by Henry Ford in 1913 reduced significantly the cost of gasoline cars as compared to electric cars. In the 1930s, National City Lines, which was a partnership of General Motors, Firestone, and Standard Oil of California purchased many electric tram networks across the country to dismantle them and replace them with GM buses. The partnership was convicted of conspiring to monopolize the sale of equipment and supplies to their subsidiary companies, but were acquitted of conspiring to monopolize the provision of transportation services. In January 1990, General Motors' President introduced its EV concept two-seater, the "Impact", at the Los Angeles Auto Show. That September, the California Air Resources Board mandated major-automaker sales of EVs, in phases starting in 1998. From 1996 to 1998 GM produced 1117 EV1s, 800 of which were made available through three-year leases. the success of the oil and auto industries' media campaign to reduce public acceptance of EVs. General Motors EV1 electric car (1996-1998), story told in movie Who Killed the Electric Car? A movie made on the subject in 2005-2006 was titled Who Killed the Electric Car? and released theatrically by Sony Pictures Classics in 2006. The film explores the roles of automobile manufacturers, oil industry, the U.S. government, batteries, hydrogen vehicles, and consumers, and each of their roles in limiting the deployment and adoption of this technology. Ford released a number of their Ford Ecostar delivery vans into the market. Honda, Nissan and Toyota also repossessed and crushed most of their EVs, which, like the GM EV1s, had been available only by closed-end lease. After public protests, Toyota sold 200 of its RAV EVs to eager buyers; they later sold at over their original forty-thousand-dollar price. This lesson did not go unlearned; BMW of Canada sold off a number of Mini EVs when their Canadian testing ended. The production of the Citroën Berlingo Electrique stopped in September 2005. During the last few decades, environmental impact of the petroleum-based transportation infrastructure, along with the fear of peak oil, has led to renewed interest in an electric transportation infrastructure. EVs differ from fossil fuel-powered vehicles in that the electricity they consume can be generated from a wide range of sources, including fossil fuels, nuclear power, and renewable sources such as tidal power, solar power, and wind power or any combination of those. The carbon footprint and other emissions of electric vehicles varies depending on the fuel and technology used for electricity generation. The electricity may then be stored on board the vehicle using a battery, flywheel, or supercapacitors. Vehicles making use of engines working on the principle of combustion can usually only derive their energy from a single or a few sources, usually non-renewable fossil fuels. A key advantage of hybrid or plug-in electric vehicles is regenerative braking, which recovers kinetic energy, typically lost during friction braking as heat, as electricity restored to the on-board battery. As of January 2018, the world's two best selling all-electric cars in history are the Nissan Leaf (left), with 300,000 in global sales  and the Tesla Model S (right), with over 200,000 in global sales. As of March 2018[update], there are some 45 series production highway-capable all-electric cars available in various countries. As of early December 2015, the Leaf, with 200,000 units sold worldwide, was the world's top-selling highway-capable all-electric car of all time, followed by the Tesla Model S with global deliveries of about 100,000 units. Leaf global sales achieved the 300,000 unit milestone in January 2018. As of May 2015[update], more than 500,000 highway-capable all-electric passenger cars and light utility vehicles had been sold worldwide since 2008, out of total global sales of about 850,000 light-duty plug-in electric vehicles. As of May 2015[update], the United States had the largest fleet of highway-capable plug-in electric vehicles in the world, with about 335,000 highway legal plug-in electric cars sold in the country since 2008, and representing about 40% of the global stock. California is the largest plug-in car regional market in the country, with almost 143,000 units sold between December 2010 and March 2015, representing over 46% of all plug-in cars sold in the U.S. Cumulative global sales of all-electric cars and vans passed the 1 million unit milestone in September 2016. Norway is the country with the highest market penetration per capita in the world, with four plug-in electric vehicles per 1000 inhabitants in 2013. In March 2014, Norway became the first country where over 1 in every 100 passenger cars on the roads is a plug-in electric. In 2016, 29% of all new car sales in the country were battery-powered or plug-in hybrids. Norway also had the world's largest plug-in electric segment market share of total new car sales, 13.8% in 2014, up from 5.6% in 2013. In June 2016, Andorra became the second country in this list, with a 6% of market share combining electric vehicles and plug-in hybrids due to a strong public policy providing multiple advantages. As of May 2015[update], there were 58,989 plug-in electric vehicles registered in Norway, consisting of 54,160 all-electric vehicles and 4,829 plug-in hybrids. By the end of 2016, Norway's 100,000th battery-powered car was sold. By some estimates electric vehicles sales may constitute almost a third of new-car sales by the end of 2030. In April of 2019, the company China BYD Auto launched the first Biarticulated Bus of the world, BYD K12A, which will operate as a test in the system BRT of Bogotá, Colombia TransMilenio in August 2019. There are many ways to generate electricity, of varying costs, efficiency and ecological desirability. (See articles on diesel-electric and gasoline-electric hybrid locomotion for information on EVs using also combustion engines). Another form of chemical to electrical conversion is fuel cells, projected for future use. A few experimental vehicles, such as some cars and a handful of aircraft use solar panels for electricity. These systems are powered from an external generator plant (nearly always when stationary), and then disconnected before motion occurs, and the electricity is stored in the vehicle until needed. Batteries, electric double-layer capacitors and flywheel energy storage are forms of rechargeable on-board electrical storage. By avoiding an intermediate mechanical step, the energy conversion efficiency can be improved over the hybrids already discussed, by avoiding unnecessary energy conversions. Furthermore, electro-chemical batteries conversions are easy to reverse, allowing electrical energy to be stored in chemical form. Most electric vehicles use lithium-ion batteries (Li-Ions or LIBs). Lithium ion batteries have higher energy density, longer life span and higher power density than most other practical batteries. Complicating factors include safety, durability, thermal breakdown and cost. Li-ion batteries should be used within safe temperature and voltage ranges in order to operate safely and efficiently. Increasing the battery's lifespan decreases effective costs. One technique is to operate a subset of the battery cells at a time and switching these subsets. In the past, Nickel Metal Hydride batteries were used among EV cars such as those made by General Motors. These battery types are considered out-dated due to their tendencies to self discharge in the heat. Also the batteries' patent was held by Chevron which created a problem for their widespread development. These detractors coupled with their high cost has led to Lithium-ion (Li-Ion) batteries leading as the predominant battery for EVs. Lithium-ion batteries' price is constantly decreasing, thus, making electric vehicles more affordable and attractive on the market. The power of a vehicle's electric motor, as in other vehicles, is measured in kilowatts (kW). 100 kW is roughly equal to 134 horsepower, but electric motors can deliver their maximum torque over a wide RPM range. This means that the performance of a vehicle with a 100 kW electric motor exceeds that of a vehicle with a 100 kW internal combustion engine, which can only deliver its maximum torque within a limited range of engine speed. Energy is lost during the process of converting the electrical energy to mechanical energy. Approximately 90% of the energy from the battery is converted to mechanical energy, the losses being in the motor and drivetrain. Usually, direct current (DC) electricity is fed into a DC/AC inverter where it is converted to alternating current (AC) electricity and this AC electricity is connected to a 3-phase AC motor. For electric trains, forklift trucks, and some electric cars, DC motors are often used. In some cases, universal motors are used, and then AC or DC may be employed. In recent production vehicles, various motor types have been implemented, for instance: Induction motors within Tesla Motor vehicles and permanent magnet machines in the Nissan Leaf and Chevrolet Bolt. It is generally possible to equip any kind of vehicle with an electric powertrain. The Chevrolet Volt is the world's top selling plug-in hybrid of all time. Global Volt/Ampera family sales passed the 100,000 unit milestone in October 2015. A plug-in electric vehicle (PEV) is any motor vehicle that can be recharged from any external source of electricity, such as wall sockets, and the electricity stored in the rechargeable battery packs drives or contributes to drive the wheels. PEV is a subcategory of electric vehicles that includes all-electric or battery electric vehicles (BEVs), plug-in hybrid vehicles, (PHEVs), and electric vehicle conversions of hybrid electric vehicles and conventional internal combustion engine vehicles. Cumulative global sales of highway-capable light-duty pure electric vehicles passed one million units in total, globally, in September 2016. Cumulative global sales of plug-in cars and utility vans totaled over 2 million by the end of 2016, of which 38% were sold in 2016, and the 3 million milestone was achieved in November 2017. As of January 2018[update], the world's top selling plug-in electric cars is the Nissan Leaf, with global sales of more than 300,000 units. As of June 2016[update], it was followed by the all-electric Tesla Model S with about 129,400 units sold worldwide, the Chevrolet Volt plug-in hybrid, which together with its sibling the Opel/Vauxhall Ampera has combined global sales of about 117,300 units, the Mitsubishi Outlander P-HEV with about 107,400 units, and the Prius Plug-in Hybrid with over 75,400 units. Global hybrid sales are by Toyota Motor Company with more than 9 million Lexus and Toyota hybrids sold as of April 2016[update], followed by Honda Motor Co., Ltd. with cumulative global sales of more than 1.35 million hybrids as of June 2014[update], Ford Motor Corporation with over 424,000 hybrids sold in the United States through June 2015, and the Hyundai Group with cumulative global sales of 200,000 hybrids as of March 2014[update], including both Hyundai Motor Company and Kia Motors hybrid models. As of April 2016[update], worldwide hybrid sales are led by the Toyota Prius liftback, with cumulative sales of over 3.7 million units. The Prius nameplate has sold more than 5.7 million hybrids up to April 2016. EVs are on the road in many functions, including electric cars, electric trolleybuses, electric buses, battery electric buses, electric trucks, electric bicycles, electric motorcycles and scooters, personal transporters, neighborhood electric vehicles, golf carts, milk floats, and forklifts. Off-road vehicles include electrified all-terrain vehicles and tractors. A streetcar (or Tram) drawing current from a single overhead wire through a pantograph. The fixed nature of a rail line makes it relatively easy to power EVs through permanent overhead lines or electrified third rails, eliminating the need for heavy onboard batteries. Electric locomotives, electric trams/streetcars/trolleys, electric light rail systems, and electric rapid transit are all in common use today, especially in Europe and Asia. 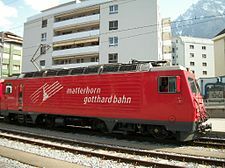 Since electric trains do not need to carry a heavy internal combustion engine or large batteries, they can have very good power-to-weight ratios. This allows high speed trains such as France's double-deck TGVs to operate at speeds of 320 km/h (200 mph) or higher, and electric locomotives to have a much higher power output than diesel locomotives. In addition, they have higher short-term surge power for fast acceleration, and using regenerative brakes can put braking power back into the electrical grid rather than wasting it. Maglev trains are also nearly always EVs. Manned and unmanned vehicles have been used to explore the Moon and other planets in the solar system. On the last three missions of the Apollo program in 1971 and 1972, astronauts drove silver-oxide battery-powered Lunar Roving Vehicles distances up to 35.7 kilometers (22.2 mi) on the lunar surface. Unmanned, solar-powered rovers have explored the Moon and Mars. Since the beginning of the dawn of the time of aviation, electric power for aircraft has received a great deal of experimentation. Currently flying electric aircraft include manned and unmanned aerial vehicles. Electric boats were popular around the turn of the 20th century. Interest in quiet and potentially renewable marine transportation has steadily increased since the late 20th century, as solar cells have given motorboats the infinite range of sailboats. Electric motors can and have also been used in sailboats instead of traditional diesel engines. Electric ferries operate routinely. Submarines use batteries (charged by diesel or gasoline engines at the surface), nuclear power, fuel cells or Stirling engines to run electric motor-driven propellers. Most large electric transport systems are powered by stationary sources of electricity that are directly connected to the vehicles through wires. Electric traction allows the use of regenerative braking, in which the motors are used as brakes and become generators that transform the motion of, usually, a train into electrical power that is then fed back into the lines. This system is particularly advantageous in mountainous operations, as descending vehicles can produce a large portion of the power required for those ascending. This regenerative system is only viable if the system is large enough to utilise the power generated by descending vehicles. In the systems above, motion is provided by a rotary electric motor. However, it is possible to "unroll" the motor to drive directly against a special matched track. These linear motors are used in maglev trains which float above the rails supported by magnetic levitation. This allows for almost no rolling resistance of the vehicle and no mechanical wear and tear of the train or track. In addition to the high-performance control systems needed, switching and curving of the tracks becomes difficult with linear motors, which to date has restricted their operations to high-speed point to point services. The type of battery, the type of traction motor and the motor controller design vary according to the size, power and proposed application, which can be as small as a motorized shopping cart or wheelchair, through pedelecs, electric motorcycles and scooters, neighborhood electric vehicles, industrial fork-lift trucks and including many hybrid vehicles. Although EVs have few direct emissions, all rely on energy created through electricity generation, and will usually emit pollution and generate waste, unless it is generated by renewable source power plants. Since EVs use whatever electricity is delivered by their electrical utility/grid operator, EVs can be made more or less efficient, polluting and expensive to run, by modifying the electrical generating stations. This would be done by an electrical utility under a government energy policy, in a timescale negotiated between utilities and government. Fossil fuel vehicle efficiency and pollution standards take years to filter through a nation's fleet of vehicles. New efficiency and pollution standards rely on the purchase of new vehicles, often as the current vehicles already on the road reach their end-of-life. Only a few nations set a retirement age for old vehicles, such as Japan or Singapore, forcing periodic upgrading of all vehicles already on the road. EVs will take advantage of whatever environmental gains happen when a renewable energy generation station comes online, a fossil-fuel power station is decommissioned or upgraded. Conversely, if government policy or economic conditions shifts generators back to use more polluting fossil fuels and internal combustion engine vehicles (ICEVs), or more inefficient sources, the reverse can happen. Even in such a situation, electrical vehicles are still more efficient than a comparable amount of fossil fuel vehicles. In areas with a deregulated electrical energy market, an electrical vehicle owner can choose whether to run his electrical vehicle off conventional electrical energy sources, or strictly from renewable electrical energy sources (presumably at an additional cost), pushing other consumers onto conventional sources, and switch at any time between the two. lithium ion polymer battery prototypes. Newer Li-poly cells provide up to 130 Wh/kg and last through thousands of charging cycles. Because of the different methods of charging possible, the emissions produced have been quantified in different ways. Plug-in all-electric and hybrid vehicles also have different consumption characteristics. Electromagnetic radiation from high performance electrical motors has been claimed to be associated with some human ailments, but such claims are largely unsubstantiated except for extremely high exposures. 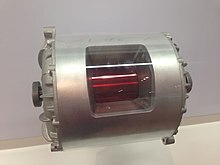 Electric motors can be shielded within a metallic Faraday cage, but this reduces efficiency by adding weight to the vehicle, while it is not conclusive that all electromagnetic radiation can be contained. If a large proportion of private vehicles were to convert to grid electricity it would increase the demand for generation and transmission, and consequent emissions. However, overall energy consumption and emissions would diminish because of the higher efficiency of EVs over the entire cycle. In the USA it has been estimated there is already nearly sufficient existing power plant and transmission infrastructure, assuming that most charging would occur overnight, using the most efficient off-peak base load sources. In the UK however, things are different. While National Grid's high-voltage electricity transmission system can currently manage the demand of 1 million electric cars, Steve Holliday (CEO National Grid PLC) said, “penetration up and above that becomes a real issue. Local distribution networks in cities like London may struggle to balance their grids if drivers choose to all plug in their cars at the same time." EVs typically charge from conventional power outlets or dedicated charging stations, a process that typically takes hours, but can be done overnight and often gives a charge that is sufficient for normal everyday usage. However, with the widespread implementation of electric vehicle networks within large cities in the UK and Europe, EV users can plug in their cars whilst at work and leave them to charge throughout the day, extending the possible range of commutes and eliminating range anxiety. A recharging system that avoids the need for a cable is Curb Connect, patented in 2012 by Dr Gordon Dower. In this system, electrical contacts are fitted into curbs, such as angle parking spaces on city streets. When a suitably authorized vehicle is parked so that its front end overhangs the curb, the curb contacts become energized and charging occurs. Another proposed solution for daily recharging is a standardized inductive charging system such as Evatran's Plugless Power. Benefits are the convenience of parking over the charge station and minimized cabling and connection infrastructure. Qualcomm is trialling such a system in London in early 2012. Yet another proposed solution for the typically less frequent, long distance travel is "rapid charging", such as the Aerovironment PosiCharge line (up to 250 kW) and the Norvik MinitCharge line (up to 300 kW). Ecotality is a manufacturer of Charging Stations and has partnered with Nissan on several installations. Battery replacement is also proposed as an alternative, although no OEMs including Nissan/Renault have any production vehicle plans. Swapping requires standardization across platforms, models and manufacturers. Swapping also requires many times more battery packs to be in the system. Instead of recharging EVs from electric socket, batteries could be mechanically replaced at special stations in a couple of minutes (battery swapping). Batteries with greatest energy density such as metal-air fuel cells usually cannot be recharged in purely electric way. Instead, some kind of metallurgical process is needed, such as aluminum smelting and similar. Silicon-air, aluminum-air and other metal-air fuel cells look promising candidates for swap batteries. Any source of energy, renewable or non-renewable, could be used to remake used metal-air fuel cells with relatively high efficiency. Investment in infrastructure will be needed. The cost of such batteries could be an issue, although they could be made with replaceable anodes and electrolyte. Instead of replacing batteries, it is possible to replace the entire chassis (including the batteries, electric motor and wheels) of an electric Modular vehicle. Such a system was patented in 2000 by Dr Gordon Dower and three road-licensed prototypes have been built by the Ridek Corporation in Point Roberts, Washington. [third-party source needed] Dower proposed that an individual might own only the body (or perhaps a few different style bodies) for their vehicle, and would lease the chassis from a pool, thereby reducing the depreciation costs associated with vehicle ownership. Conventional electric double-layer capacitors are being worked to achieve the energy density of lithium ion batteries, offering almost unlimited lifespans and no environmental issues. High-K electric double-layer capacitors, such as EEStor's EESU, could improve lithium ion energy density several times over if they can be produced. Lithium-sulphur batteries offer 250 Wh/kg. Sodium-ion batteries promise 400 Wh/kg with only minimal expansion/contraction during charge/discharge and a very high surface area. Researchers from one of the Ukrainian state universities claim that they have manufactured samples of pseudocapacitor based on Li-ion intercalation process with 318 Wh/kg specific energy, which seem to be at least two times improvement in comparison to typical Li-ion batteries. There is a growing concern about the safety of EVs, given the demonstrated tendency of the Lithium-ion battery, most promising for EV use because of its high energy density, to overheat, possibly leading to fire or explosion, especially when damaged in a crash. The U.S. National Highway Traffic Safety Administration opened a defect investigation of the Chevy Volt on November 25, 2011 amid concerns over the risk of battery fires in a crash. At that time, automotive consulting firm CNW Marketing Research reported a decline in consumer interest in the Volt, citing the fires as having made an impact on consumer perception. Consumer response impelled GM to make safety enhancements to the battery system in December, and the NHTSA closed its investigation on January 20, 2012, finding the matter satisfactorily resolved with "no discernible defect trend" remaining. The agency also announced it has developed interim guidance to increase awareness and identify appropriate safety measures regarding electric vehicles for the emergency response community, law enforcement officers, tow truck operators, storage facilities and consumers. EVs release no tail pipe air pollutants at the place where they are operated. They also typically generate less noise pollution than an internal combustion engine vehicle, whether at rest or in motion. The energy that electric and hybrid cars consume is usually generated by means that have environmental impacts. Nevertheless, adaptation of EVs would have a significant net environmental benefit, except in a few countries that continue to rely on older coal fired power plants for the bulk of their electricity generation throughout the life of the car. There are special kind of electric vehicles named SAFA TEMPO in Nepal that help lower the pollution created by vehicles. These vehicles are powered by electricity - usually charged batteries - rather than oil or gas and currently heavily promoted by the government to facilitate environmental and vehicle management issues. Electric motors don't require oxygen, unlike internal combustion engines; this is useful for submarines and for space rovers. A study by Cambridge Econometrics shows the potential air pollution benefits of EVs. According to one of the scenarios in the study, Europe would be on track to reduce CO2 emissions from cars by 88% by 2050. The associated technology improvements would cut toxic nitrogen oxides (NOx) from cars from around 1.3 million tonnes per year to around 70,000 tonnes per year. Electric motors are mechanically very simple and often achieve 90% energy conversion efficiency over the full range of speeds and power output and can be precisely controlled. They can also be combined with regenerative braking systems that have the ability to convert movement energy back into stored electricity. This can be used to reduce the wear on brake systems (and consequent brake pad dust) and reduce the total energy requirement of a trip. Regenerative braking is especially effective for start-and-stop city use. They can be finely controlled and provide high torque from rest, unlike internal combustion engines, and do not need multiple gears to match power curves. This removes the need for gearboxes and torque converters. EVs provide quiet and smooth operation and consequently have less noise and vibration than internal combustion engines. While this is a desirable attribute, it has also evoked concern that the absence of the usual sounds of an approaching vehicle poses a danger to blind, elderly and very young pedestrians. To mitigate this situation, automakers and individual companies are developing systems that produce warning sounds when EVs are moving slowly, up to a speed when normal motion and rotation (road, suspension, electric motor, etc.) noises become audible. Electricity can be produced from a variety of sources, therefore it gives the greatest degree of energy resilience. EV 'tank-to-wheels' efficiency is about a factor of 3 higher than internal combustion engine vehicles. Energy is not consumed while the vehicle is stationary, unlike internal combustion engines which consume fuel while idling. However, looking at the well-to-wheel efficiency of EVs, their total emissions, while still lower, are closer to an efficient gasoline or diesel in most countries where electricity generation relies on fossil fuels. Well-to-wheel efficiency of an EV has less to do with the vehicle itself and more to do with the method of electricity production. A particular EV would instantly become twice as efficient if electricity production were switched from fossil fuel to a wind or tidal primary source of energy. Thus, when "well-to-wheels" is cited, one should keep in mind that the discussion is no longer about the vehicle, but rather about the entire energy supply infrastructure - in the case of fossil fuels this should also include energy spent on exploration, mining, refining, and distribution. The lifecycle analysis of EVs shows that even when powered by the most carbon intensive electricity in Europe, they emit less greenhouse gases than a conventional diesel vehicle. The cost of operating an EV varies wildly depending on location. In some parts of the world, an EV costs less to drive than a comparable gas-powered vehicle, as long as the higher initial purchase price is not factored in. In the US, in states which have a tiered electricity rate schedule, "fuel" for EVs today costs owners significantly more than fuel for a comparable gas-powered vehicle. 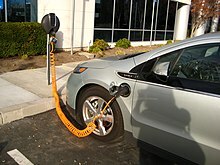 A 2011 study done by Purdue University found that in California most users already reach the third pricing tier for electricity each month, and adding an EV could push them into the fourth or fifth (highest, most expensive) tier, meaning that they will be paying in excess of $0.45 per kWh for electricity to recharge their vehicle. At this price, which is higher than the average electricity price in the US, it is dramatically more expensive to drive a pure-EV than it is to drive a traditional pure-gas powered vehicle. "The objective of a tiered pricing system is to discourage consumption. It's meant to get you to think about turning off your lights and conserving electricity. In California, the unintended consequence is that plug-in hybrid cars won't be economical under this system," said Tyner (the author), whose findings were published in the online version of the journal Energy Policy. Since EVs can be plugged into the electric grid when not in use, there is a potential for battery-powered vehicles to even cut the demand for electricity by feeding electricity into the grid from their batteries during peak use periods (such as midafternoon air conditioning use) while doing most of their charging at night, when there is unused generating capacity. This vehicle-to-grid (V2G) connection has the potential to reduce the need for new power plants, as long as vehicle owners do not mind reducing the life of their batteries, by being drained by the power company during peak demand. It is also proved that an electric vehicle parking lot was able to well play the role of an agent that provides demand response. Furthermore, our current electricity infrastructure may need to cope with increasing shares of variable-output power sources such as wind and solar PV. This variability could be addressed by adjusting the speed at which EV batteries are charged, or possibly even discharged. 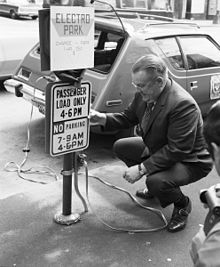 Some concepts see battery exchanges and battery charging stations, much like gas/petrol stations today. Clearly these will require enormous storage and charging potentials, which could be manipulated to vary the rate of charging, and to output power during shortage periods, much as diesel generators are used for short periods to stabilize some national grids. Electric vehicles may have shorter range compared to Internal Combustion Engines, however, the price per mile of electric vehicles is falling. Most owners opt to charge their vehicles primarily at their houses while not in use due to their typically slower charging times, and added convenience. In cold climates, considerable energy is needed to heat the interior of a vehicle and to defrost the windows. With internal combustion engines, this heat already exists as waste combustion heat diverted from the engine cooling circuit. This process offsets the greenhouse gases' external costs. If this is done with battery EVs, the interior heating requires extra energy from the vehicles' batteries. Although some heat could be harvested from the motor or motors and battery, their greater efficiency means there is not as much waste heat available as from a combustion engine. However, for vehicles which are connected to the grid, battery EVs can be preheated, or cooled, with little or no need for battery energy, especially for short trips. Newer designs are focused on using super-insulated cabins which can heat the vehicle using the body heat of the passengers. This is not enough, however, in colder climates as a driver delivers only about 100 W of heating power. A heat pump system, capable of cooling the cabin during summer and heating it during winter, seems to be the most practical and promising way of solving the thermal management of the EV. Ricardo Arboix introduced (2008) a new concept based on the principle of combining the thermal-management of the EV-battery with the thermal-management of the cabin using a heat pump system. This is done by adding a third heat-exchanger, thermally connected with the battery-core, to the traditional heat pump/air conditioning system used in previous EV-models like the GM EV1 and Toyota RAV4 EV. The concept has proven to bring several benefits, such as prolonging the life-span of the battery as well as improving the performance and overall energy-efficiency of the EV. Shifts from private to public transport (train, trolleybus, personal rapid transit or tram) have the potential for large gains in efficiency in terms of an individual's distance traveled per kWH. Research shows people do prefer trams, because they are quieter and more comfortable and perceived as having higher status. Therefore, it may be possible to cut liquid fossil fuel consumption in cities through the use of electric trams. 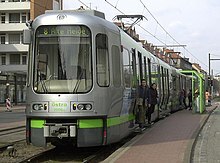 Trams may be the most energy-efficient form of public transportation, with rubber wheeled vehicles using 2/3 more energy than the equivalent tram, and run on electricity rather than fossil fuels. In terms of net present value, they are also the cheapest—Blackpool trams are still running after 100-years, but combustion buses only last about 15-years. In May 2017, India was the first to announce plans to sell only electric vehicles by 2030. Prime Minister Narendra Modi's government kickstarted the ambitious plan by floating a tender to purchase 10,000 electric vehicles, hailed as "the world’s single-largest EV procurement initiative." Along with fulfilling the urgent need to keep air pollution in check, the Indian government aims at reducing the petroleum import bill and running cost of vehicles. With nearly a third of all cars sold in 2017 of all new cars either fully electric or a hybrid, Norway is the world leader in the adoption of electric cars and pushes to sell only electric or hybrid cars by 2030. The other nations followed the lead, with France and UK announcing the plan to ban the sale of gas and diesel cars by 2040. Austria, China, Denmark, Germany, Ireland, Japan, the Netherlands, Portugal, Korea and Spain have also set official targets for electric car sales. Many governments offer incentives to promote the use of electric vehicles, with the goals of reducing air pollution and oil consumption. Some incentives intend to increase purchases of electric vehicles by offsetting the purchase price with a grant. Other incentives include lower tax rates or exemption from certain taxes, and investment in charging infrastructure. San Diego's local private utility, San Diego Gas and Electric (SDG&E), offers its customers an electric vehicle incentive of $10,000 for a 2017 BMW i3. Sonoma Clean Power, the public utility that serves both Sonoma and Mendocino, offers its customers EV incentives up to $2,000 on a Volkswagen e-Golf. In addition, Volkswagen offers an incentive of $7,000 towards the purchase of an e-Golf. On top of these local incentives, and the federal tax credit, California residents can receive state incentives up to $2,500 in the form of state rebates. Therefore, Sonoma Clean Power customers can potentially save up to $19,000 on an e-Wolf. In March 2018, NPR reported that demand for electricity in the U.S. had begun to decline. The Tennessee Valley Authority projected a 13 percent drop in demand among the seven states it serves, which is "the first persistent decline in the federally owned agency's 85-year history." To combat this, companies in the utility sector launched programs to get more involved in the electric car market. For example, utility companies began to invest in electric vehicle charging infrastructure and to team up with automobile manufacturers to offer rebates to people who purchase electric vehicles. In the UK the Office for Low Emission Vehicles offers grants for the installation of up to two charge points both in private residences and up to 20 for commercial organisations. Over 9000 Londoners may die early every year from toxic air. Transport is a major contributor to the problem, so the city plans to become Europe’s ultra-low-emissions vehicle capital and achieve zero transport emissions by 2050. A government-funded scheme is helping London’s boroughs install over 1000 charge points across the city by the end of 2020. Ferdinand Dudenhoeffer, head of the Centre of Automotive Research at the Gelsenkirchen University of Applied Sciences in Germany, said that "by 2025, all passenger cars sold in Europe will be electric or hybrid electric". First, advances in lithium ion batteries, in large part driven by the consumer electronics industry, allow full-sized, highway-capable EVs to be propelled as far on a single charge as conventional cars go on a single tank of gasoline. Lithium batteries have been made safe, can be recharged in minutes instead of hours (see recharging time), and now last longer than the typical vehicle (see lifespan). The production cost of these lighter, higher-capacity lithium batteries is gradually decreasing as the technology matures and production volumes increase (see price history). Toyota Motors Corporation is trying to replace the current lithium ion battery with solid-state battery technology by 2020. The solid-state battery replaces the liquid electrolyte with a solid electrolyte. 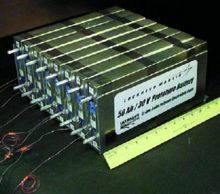 Rechargeable lithium-air batteries potentially offer increased range over other types and are a current topic of research. Another improvement is to decouple the electric motor from the battery through electronic control, employing supercapacitors to buffer large but short power demands and regenerative braking energy. The development of new cell types combined with intelligent cell management improved both weak points mentioned above. The cell management involves not only monitoring the health of the cells but also a redundant cell configuration (one more cell than needed). With sophisticated switched wiring it is possible to condition one cell while the rest are on duty. Electric Renault Midlum used by Nestlé. Small electric trucks have been used for decades for specific and/or limited uses, such as milk floats or the electric Renault Maxity. Larger electric trucks have been made in the 2010s, such as prototypes of electric Renault Midlum tested in real conditions and trucks by E-Force One and Emoss. Mercedes-Benz, a division of Daimler, began delivering ten eActros units to customers in September 2018 for a two-year real-world test. DAF, a division of Paccar, delivered its first CF articulated truck to Jumbo for testing in December 2018. Fuso, a division of Daimler, began deliveries of the eCanter in 2017. Freightliner, another division of Daimler, began delivering e-M2 trucks to Penske in December 2018, and will commercialise its larger e-Cascadia in 2019. MAN, a division of Volkswagen AG, delivered its first unit of its e-TGM articulated truck to Porsche in December 2018, larger-scale production is scheduled to begin in 2019. Renault and Volvo will launch their first mass-produced electric trucks in early 2019. Announced in 2017, the Tesla Semi, is expected to hit production lines in 2019. Particularly in Europe, fuel-cell electric trains are gaining in popularity to replace Diesel-electric units. In Germany, several Länder have ordered Alstom Coradia iLINT trainsets, in service since 2018, with France also planning to order trainsets. The United Kingdom, the Netherlands, Denmark, Norway, Italy, Canada and Mexico are equally interested. In France, the SNCF plans to replace all its remaining Diesel-electric trains with hydrogen trains by 2035. In the United Kingdom, Alstom announced in 2018 their plan to retrofit British Rail Class 321 trainsets with fuel cells. ^ Asif Faiz; Christopher S. Weaver; Michael P. Walsh (1996). Air Pollution from Motor Vehicles: Standards and Technologies for Controlling Emissions. World Bank Publications. p. 227. ISBN 978-0-8213-3444-7. ^ "Obama Administration Announces Federal and Private Sector Actions to Accelerate Electric Vehicle Adoption in the United States". ^ "EU policy-makers seek to make electric transport a priority". Reuters. 2015-02-03. ^ "Auto & Mobility Trends In 2019". CB Insights Research. Retrieved 2019-03-28. ^ Guarnieri, M. (2012). Looking back to electric cars. Proc. HISTELCON 2012 – 3rd Region-8 IEEE HISTory of Electro - Technology CONference: The Origins of Electrotechnologies. pp. 1–6. doi:10.1109/HISTELCON.2012.6487583. ISBN 978-1-4673-3078-7. ^ mary bellis (2010-06-16). "Inventors - Electric Cars (1890 - 1930)". Inventors.about.com. Retrieved 2010-12-26. ^ "History of Railway Electric Traction". Mikes.railhistory.railfan.net. Retrieved 2010-12-26. ^ "Escaping Lock-in: the Case of the Electric Vehicle". Cgl.uwaterloo.ca. Retrieved 2010-12-26. ^ See Loeb, A.P., "Steam versus Electric versus Internal Combustion: Choosing the Vehicle Technology at the Start of the Automotive Age," Transportation Research Record, Journal of the Transportation Research Board of the National Academies, No. 1885, at 1. ^ Matthe, Roland; Eberle, Ulrich (2014-01-01). "The Voltec System: Energy Storage and Electric Propulsion". The Voltec System - Energy Storage and Electric Propulsion. pp. 151–176. ISBN 9780444595133. Retrieved 2014-05-04. ^ Quiroga, Tony (August 2009). Driving the Future. Hachette Filipacchi Media U.S., Inc. p. 52. ^ Eberle, Ulrich; von Helmolt, Rittmar (2010-05-14). "Sustainable transportation based on EV concepts: a brief overview". Energy & Environmental Science. 3 (6): 689. doi:10.1039/C001674H. Retrieved 2010-06-08. ^ Notter, Dominic A.; Kouravelou, Katerina; Karachalios, Theodoros; Daletou, Maria K.; Haberland, Nara Tudela (2015-07-03). "Life cycle assessment of PEM FC applications: electric mobility and μ-CHP". Energy Environ. Sci. 8 (7): 1969–1985. doi:10.1039/c5ee01082a. ^ Notter, Dominic A.; Gauch, Marcel; Widmer, Rolf; Wäger, Patrick; Stamp, Anna; Zah, Rainer; Althaus, Hans-Jörg (2010-09-01). "Contribution of Li-Ion Batteries to the Environmental Impact of Electric Vehicles". Environmental Science & Technology. 44 (17): 6550–6556. doi:10.1021/es903729a. ISSN 0013-936X. PMID 20695466. ^ a b c "Nissan delivers 300,000th Nissan LEAF" (Press release). Yokohama: Nissan. 2018-01-08. Retrieved 2018-01-14. ^ Cobb, Jeff (2018-01-22). "Tesla Quietly Sold 200000th Model S Last Year". HybridCars.com. Retrieved 2018-09-02. The Volt/Ampera family of vehicles is the world's all-time third best selling plug-in electric car after the Nissan Leaf (240,000), and the Tesla Model S (over 150,000), with 130,500 vehicles sold globally through November 2016. ^ Jeff Cobb (2015-12-08). "Plug-in Pioneers: Nissan Leaf and Chevy Volt Turn Five Years Old". HybriCars.com. Retrieved 2015-12-09. See table with ranking: "World's Top Best Selling Plug-in Electric cars." Accounting for global cumulative sales by early December 2015, plug-in electric car sales were led by the Nissan Leaf (200,000), followed by Volt/Ampera family (104,000), and the Tesla Model S (100,000). As of November 2015[update], ranking next were the Mitsubishi Outlander P-HEV (85,000) and the Prius Plug-in Hybrid (75,000). ^ Jeff Cobb (2015-06-01). "Renault-Nissan And Leaf Lead All In Global EV Proliferation". HybridCars.com. Retrieved 2015-06-14. About 510,000 battery electric cars and light-duty vans had been sold worldwide by May 2015. ^ Jeff Cobb (2015-06-09). "European Plug-in Sales Leap Ahead of US For The First Time". HybridCars.com. Retrieved 2015-06-14. Cumulative global sales totaled about 850,000 highway legal plug-in electric passenger cars and light-duty vehicles by May 2015. ^ a b Jeff Cobb (2015-02-18). "Top 6 Plug-In Vehicle Adopting Countries – 2014". HybridCars.com. Retrieved 2015-06-26. Cumulative plug-in electric car sales in the U.S. totaled 291,332 units between 2008 and December 2014. ^ Jeff Cobb (2015-06-03). "May 2015 Dashboard". HybridCars.com and Baum & Associates. Retrieved 2015-06-26. See sections: "May 2015 Plug-in Hybrid Car Sales Numbers" and "May 2015 Battery Electric Car Sales Numbers." A total of 43,560 plug-in electric cars were sold during the first five months of 2015, consisting of 15,100 plug-in hybrids and 28,460 battery electric cars. ^ Jeff Cobb (2015-03-18). "Californians Bought More Plug-in Cars Than China Last Year". HybridCars.com. Retrieved 2015-03-18. ^ Alan Ohnsman (2014-09-09). "Californians Propel Plug-In Car Sales With 40% of Market". Bloomberg News. Archived from the original on 2014-09-09. Retrieved 2014-09-09. ^ California New Car Dealers Association (CNCDA) (February 2015). "California Auto Outlook Covering Fourth Quarter 2014: New Light Vehicle Registrations Likely to Exceed 1.9 million units in 2015" (PDF). CNCDA. Archived from the original (PDF) on 2015-09-23. Retrieved 2015-03-15. Registrations through December 2014 since 2010. ^ California New Car Dealers Association (CNCDA) (May 2015). "New Light Vehicle Registrations in California Should Approach Two million units in 2015" (PDF). CNCDA. Archived from the original (PDF) on 2015-08-12. Retrieved 2015-06-22. Registrations through March 2015 since 2011. Revised figures for 2014. ^ a b Shahan, Zachary (2016-11-22). "1 Million Pure EVs Worldwide: EV Revolution Begins!". Clean Technica. Retrieved 2016-11-23. ^ Jeff Cobb (2014-01-16). "Top 6 Plug-In Vehicle Adopting Countries". HybridCars.com. Retrieved 2014-01-18. Over 172,000 highway-capable passenger vehicles were sold in the U.S. between 2008 and December 2013. ^ Staff (2014-04-02). "Elbilsalget i mars slo alle rekorder" [Electric vehicle sales in March broke all records] (in Norwegian). Grønn bil. Archived from the original on 2014-04-05. Retrieved 2014-04-03. ^ Matthew Klippenstein (2014-04-08). "One Percent Of Norway's Cars Are Already Plug-In Electrics". Green Car Reports. Retrieved 2014-04-09. ^ a b "Sales of green vehicles are booming in Norway". The Economist. 2017-02-18. ^ Staff (2014-01-08). "Over 20.000 ladbare biler på norske veier" [Over 20,000 rechargeable electric cars on Norwegian road] (in Norwegian). Grønn bil. Archived from the original on 2014-01-23. Retrieved 2014-01-13. ^ "El Principat ja és capdavanter en mobilitat elèctrica". Ara Andorra. 2016-06-02. Retrieved 2016-06-03. ^ "Pla Engega 2016". www.tramits.ad. Archived from the original on 2016-06-25. Retrieved 2016-06-03. ^ "Ladbare biler i Norge mai, 2015" [Rechargeable cars in Norway in May 2015] (in Norwegian). Grønn bil. June 2015. Archived from the original on 2015-01-17. Retrieved 2015-06-27. Click on the bar graph "Registrerte biler" and select "12 mnd" for registrations for each year. Registrations include new and used imports. Move the mouse over each bar to show the sales split between all-electric and plug-in hybrids by year. ^ "The Electric-Car Boom Is So Real Even Oil Companies Say It's Coming". Bloomberg.com. 2017-04-25. Retrieved 2017-04-26. ^ "BYD manufactures the world's first bi-articulated bus". BYD Electric Colombia. 2019-04-04. Retrieved 2019-04-04. ^ "Bogotá would have the longest electric bus in the world in August 2019". rcnradio.com. 2019-04-04. Retrieved 2019-04-04. ^ Lu, L.; Han, X.; Li, J.; Hua, J.; Ouyang, M. (2013). "A review on the key issues for lithium-ion battery management in electric vehicles". Journal of Power Sources. 226: 272–288. doi:10.1016/j.jpowsour.2012.10.060. ^ Adany, Ron (June 2013). "Switching algorithms for extending battery life in Electric Vehicles". Journal of Power Sources. 231: 50–59. doi:10.1016/j.jpowsour.2012.12.075. Retrieved 28 October 2013. ^ Mok, Brian. "Types of Batteries Used for Electric Vehicles". large.stanford.edu. ^ "Alternative Fuels Data Center: Batteries for Hybrid and Plug-In Electric Vehicles". www.afdc.energy.gov. AFDC. ^ "Chevron and EVs – GM, Chevron and CARB killed the sole NiMH EV once, will do so again". www.ev1.org. ^ Aditya, Jayam; Ferdowsi, Mehdi. "Comparison of NiMH and Li-Ion Batteries in Automotive Applications". Power Electronics and Motor Drives Laboratory. ^ "Bloomberg's Latest Forecast Predicts Rapidly Falling Battery Prices". 2018-06-21. ^ "Wells to wheels: Electric car efficiency". 2013-02-22. ^ Widmar, Martin (2015). "Electric vehicle traction motors without rare earth magnets". Sustainable Materials and Technologies. 3: 7–13. doi:10.1016/j.susmat.2015.02.001. ^ Jeff Cobb (2015-11-04). "GM Sells Its 100,000th Volt in October". HybridCars.com. Retrieved 2015-11-04. About 102,000 units of the Volt/Ampera family have been sold worldwide by the end of October 2015. ^ David B. Sandalow, ed. (2009). Plug-In Electric Vehicles: What Role for Washington? (1st. ed.). The Brookings Institution. pp. 2–5. ISBN 978-0-8157-0305-1. See definition on pp. 2. ^ "Plug-in Electric Vehicles (PEVs)". Center for Sustainable Energy, California. Retrieved 2010-03-31. ^ "PEV Frequently Asked Questions". Duke Energy. Archived from the original on 2012-03-27. Retrieved 2010-12-24. ^ "Publication: Global EV Outlook 2017". www.iea.org. Retrieved 2017-06-08. ^ Cobb, Jeff (2016-12-27). "China Takes Lead As Number One In Plug-in Vehicle Sales". HybridCars.com. Retrieved 2017-01-06. As of November 2016[update], cumulative sales of plug-in vehicles in China totaled 846,447 units, including passenger and commercial vehicles, making it the world's leader in overall EV sales. With cumulative sales of about 600,000 passenger EVs through November 2016, China is also the global leader in the EV industry, ahead of Europe and the U.S.
^ Vaughan, Adam (2017-12-25). "Electric and plug-in hybrid cars whiz past 3m mark worldwide". The Guardian. Retrieved 2018-01-20. "The number of fully electric and plug-in hybrid cars on the world's roads passed the 3 million mark in November 2017." ^ Cobb, Jeff (2016-08-10). "Global 10 Best-Selling Plug-In Cars Are Accelerating Forward". HybridCars.com. Retrieved 2016-08-13. As of June 2016[update], cumulative global sales of the top selling plug-in electric cars were led by the Nissan Leaf (over 228,000), followed by the Tesla Model S (129,393), Votl/Ampera family (about 117,300), Mitsubishi Outlander PHEV (about 107,400), Toyota Prius PHV (over 75,400), BYD Qin (56,191), Renault Zoe (51,193), BMW i3 (around 49,500), Mitsubishi i-MiEV family (about 37,600) and BYD Tang (37,509). ^ Cobb, Jeff (2016-06-06). "Americans Buy Their Four-Millionth Hybrid Car". HybridCars.com. Retrieved 2016-06-06. ^ Dan Rutherford (2014-04-04). "Hybrids break through in the Japan auto market". International Council on Clean Transportation (ICCT). Retrieved 2015-01-25. ^ International Council on Clean Transportation (ICCT) (2016). "European Vehicle Market Statistics - Pocketbook 2015/16" (PDF). ICCT. Retrieved 2016-06-17. See Figure 4-2 and 4-6, pp 41-44. See also tables in pp. 81-107 for HEV market by country from 2001 to 2014. ^ "Worldwide Sales of Toyota Hybrids Surpass 9 Million Units" (Press release). Toyota City, Japan: Toyota. 2016-05-20. Retrieved 2016-05-22. ^ Honda Press Release (2012-10-15). "Cumulative worldwide sales of Honda hybrids passes 1 million units". Green Car Congress. Retrieved 2012-10-16. ^ Roger Schreffler (2014-07-14). "Toyota Strengthens Grip on Japan EV, Hybrid Market". Ward's AutoWorld. Archived from the original on 2014-05-02. Retrieved 2014-04-30. Honda sold 187,851 hybrids in 2013. ^ Roger Schreffler (2014-08-20). "Toyota Remains Unchallenged Global Hybrid Leader". Ward's AutoWorld. Archived from the original on 2014-10-09. Retrieved 2014-10-04. Honda sold 158,696 hybrids during the first six months of 2014. ^ Will Nichols (2012-06-25). "Ford tips hybrids to overshadow electric cars". Business Green. Retrieved 2012-10-16. By June 2012 Ford had sold 200,000 full hybrids in the US since 2004. ^ Jeff Cobb (2013-04-22). "December 2012 Dashboard". HybridCars.com and Baum & Associates. Retrieved 2013-09-08. See the section: December 2012 Hybrid Cars Numbers. A total of 434,498 hybrid electric vehicles were sold during 2012. Ford sold 32,543 hybrids in the U.S. during 2012, including 14,100 Ford Fusion Hybrids, 10,935 C-Max Hybrids, 6,067 Lincoln MKZ Hybrids, and 1,441 Ford Escape Hybrids. ^ Jeff Cobb (2014-01-06). "December 2013 Dashboard". HybridCars.com and Baum & Associates. Retrieved 2014-01-11. ^ Jeff Cobb (2015-01-06). "December 2014 Dashboard". HybridCars.com and Baum & Associates. Retrieved 2015-01-21. ^ Jeff Cobb (2015-07-02). "June 2015 Dashboard". HybridCars.com and Baum & Associates. Retrieved 2015-08-22. ^ IHS Inc. (2014-05-16). "News - Hyundai-Kia reports cumulative global hybrid sales of 200,000 units". IHS Technology. Retrieved 2014-10-04. ^ Millikin, Mike (2016-05-20). "Worldwide sales of Toyota hybrids surpass 9 million units; Prius family accounts for 63%". Green Car Congress. Retrieved 2016-05-22. The Prius family accounts for 63% of Toyota's total global cumulative hybrid car sales: 5.691 million units, consisting of Prius liftback: 3.733 million; Aqua, Prius c: 1.249 million; Prius α, Prius v, Prius +: 0.634 million; Prius PHV: 75,000. ^ "Electric Driveline Technology - PVI, leader de la traction électrique pour véhicules industriels". Pvi.fr. Retrieved 2012-03-30. ^ "-Maglev Technology Explained". North American Maglev Transport Institute. 1 January 2011. Archived from the original on 27 July 2011. ^ "Technologies of Broad Benefit: Power". Retrieved 6 September 2018. ^ "Soviet Union Lunar Rovers". Retrieved 6 September 2018. 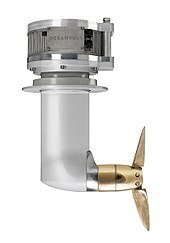 ^ "Oceanvolt – Complete Electric Motor Systems". Oceanvolt. ^ Stensvold, Tore. "Lønnsomt å bytte ut 70 prosent av fergene med batteri- eller hybridferger" Teknisk Ukeblad, 14. august 2015. ^ "S-80: A Sub, for Spain, to Sail Out on the Main". Defense Industry Daily. 15 Dec 2008. ^ "Contributions to Deep Space 1". 14 April 2015. ^ Varga, Bogdan Ovidiu (20 February 2012). "Energy management of electric and hybrid vehicles dependent on powertrain configuration". Central European Journal of Engineering. 2 (2): 253–263. doi:10.2478/s13531-011-0066-x. ^ Knipping, E. and Duvall, M. (June 2007) "Environmental Assessment of Plug-In Hybrid Electric Vehicles Volume 2: United States Air Quality Analysis Based on AEO-2006 Assumptions for 2030" Archived November 28, 2007, at the Wayback Machine Electric Power Research Institute and Natural Resources Defense Council. Retrieved July 21, 2007. ^ "GreenFacts summary of the IARC Evaluation of Static and Extremely Low-Frequency (ELFs) Electric and Magnetic Fields". Greenfacts.org. 2010-12-19. Retrieved 2010-12-26. ^ a b Liasi, Sahand Ghaseminejad, and Masoud Aliakbar Golkar. "Electric vehicles connection to microgrid effects on peak demand with and without demand response." In Electrical Engineering (ICEE), 2017 Iranian Conference on, pp. 1272-1277. IEEE, 2017. ^ "PNNL: Newsroom - Mileage from megawatts: Study finds enough electric capacity to "fill up" plug-in vehicles across much of the nation". Pnl.gov. 2006-12-11. Retrieved 2010-12-26. ^ Dower, Gordon (2012). "US Patent: Docking bay for conditionally supplying battery recharging energy to a vehicle utilizing non plug-in electrical contact between a pair of docking bay contacts and a pair of vehicle contacts"
^ Dallas Kachan (January 20, 2010). "'Disaster' scenarios for electric cars". Cleantech Group. Archived from the original on 2010-01-23. Retrieved 2010-03-09. ^ Hubbard, Nate (September 18, 2009). "Electric (Car) Company". Wytheville News. Archived from the original on January 11, 2013. Retrieved 2009-09-19. ^ Jim Motavalli (February 26, 2010). "Evatran Hoping To Cash In On Plug-Free Electric Cars". CBS Interactive Inc. (bnet.com). Retrieved 2010-03-09. ^ "London charges ahead with wireless electric vehicle technology". Source London, Transport for London. 10 November 2011. Archived from the original on 24 April 2012. Retrieved 2011-11-11. ^ "First Electric Vehicle Wireless Charging Trial Announced for London". Qualcomm Incorporated. 10 November 2011. Retrieved 2011-11-11. ^ a b c Kintner-Meyer, M.; Schneider, K.; Pratt, R. (November 2007). "Impacts Assessment of Plug-in Hybrid Vehicles on Electric Utilities and Regional U.S. Power Grids Part 1: Technical Analysis". Pacific Northwest National Laboratory: 21–24. CiteSeerX 10.1.1.105.663. ^ 16 mei 2009. "The Future of Gas Stations, Electric Battery Swap Station". YouTube. Retrieved 2010-02-12. ^ 7 maart 2007. "Unlimited Range Electric Car". YouTube. Retrieved 2010-02-12. ^ Choi, Yun Seok; Kim, Seok; Choi, Soo Seok; Han, Ji Sung; Kim, Jan Dee; Jeon, Sang Eun; Jung, Bok Hwan (2004-11-30). "Electrochimica Acta : Effect of cathode component on the energy density of lithium–sulfur battery". Electrochimica Acta. 50 (2–3): 833–835. doi:10.1016/j.electacta.2004.05.048. ^ Nazar, L. F.; Toghill, K.; Makimura, Y.; Makahnouk, W. R. M.; Ellis, B. L. (October 2007). "A multifunctional 3.5 V iron-based phosphate cathode for rechargeable batteries". Nature Materials. 6 (10): 749–753. doi:10.1038/nmat2007. Retrieved 2010-12-26. ^ Grigorchak, I. I. "Redox Processes and Pseudocapacitance of Capacitors in Light of Intercalation Nanotechnologies". Russian Journal of Electrochemistry. 39 (6). pp. 695–698. doi:10.1023/A:1024173832171. ^ "EUROPA - Press Releases - Car safety: European Commission welcomes international agreement on electric and hybrid cars". Europa.eu. 2010-03-10. Retrieved 2010-06-26. ^ Vlasic, Bill; Bunkley, Nick (2011-12-07). "G.M. Re-examines Volt as Safety Concerns Rise". New York Timesdate=2011-12-07. Retrieved 2011-12-17. ^ Bunkley, Nick; Vlasic, Bill (2012-01-20). "In Fire Investigation, Regulators Say They Found No Defect in Volt". The New York Times. Retrieved 2012-01-21. ^ "NHTSA concludes safety defect investigation into post-crash fire risk of the Volt". Green Car Congress. 2012-01-20. Retrieved 2012-01-21. ^ a b c "Transport: Electric vehicles - European commission". Ec.europa.eu. Archived from the original on 2011-03-19. Retrieved 2009-09-19. ^ Chip Gribben. "Debunking the Myth of EVs and Smokestacks". Retrieved 15 October 2010. ^ Buekers, J; Van Holderbeke, M; Bierkens, J; Int Panis, L (2014). "Health and environmental benefits related to electric vehicle introduction in EU countries". Transportation Research Part D: Transport and Environment. 33: 26–38. doi:10.1016/j.trd.2014.09.002. ^ "Seminar on EVs-ClimateChange". Vimeo. Retrieved 2016-09-29. ^ "SAFA Tempos: Electric Vehicles to Save Pollution(Electric Vehicle in Nepal)". Paranjaya Paudel. August 4, 2012. Retrieved December 13, 2014. ^ "Electromobility could create over 200,000 net additional jobs by 2030 in Europe – study | Transport & Environment". www.transportenvironment.org. Retrieved 2018-02-22. ^ "Nissan Adds 'Beautiful' Noise to Make Silent Electric Cars Safe". Bloomberg.com. 2009-09-18. Retrieved 2010-02-12. ^ "Our Electric Future — The American, A Magazine of Ideas". American.com. Archived from the original on 2014-08-25. Retrieved 2010-12-26. ^ Aaron R. Holdway; Alexander R. Williams; Oliver R. Inderwildi; David A. King (2010). "Indirect emissions from electric vehicles: emissions from electricity generation". Energy & Environmental Science. 3 (12): 1825. doi:10.1039/C0EE00031K. ^ Nealer, Rachael; Reichmuth, David; Anair, Don (November 2015). "Cleaner Cars from Cradle to Grave: How Electric Cars Beat Gasoline Cars on Lifetime Global Warming Emissions" (PDF). Union of Concerned Scientists (UCS). Retrieved 2014-11-22. ^ Sebastian Blanco (2015-11-17). "UCS: Well-to-wheel, EVs cleaner than pretty much all gas cars". Autoblog (website). Retrieved 2015-11-22. ^ Lepetit, Yoann (October 2017). "Electric vehicle life cycle analysis and raw material availability" (PDF). Transport & Environment. Retrieved 22 February 2018. ^ Tyner, Wally. "Electricity pricing policies may make or break plug-in hybrid buys". Purdue University. ^ "Engines and Gas Turbines | Claverton Group". Claverton-energy.com. 2008-11-18. Retrieved 2009-09-19. ^ "Electric vehicle price is rising, but cost-per-mile is falling". Ars Technica. Retrieved 2018-06-08. ^ "Twitter poll results: More electric cars get charged at work than at public chargers". Green Car Reports. Retrieved 2018-06-08. ^ "Introduction and background" (PDF). Archived from the original (PDF) on 2015-01-07. Retrieved 2010-12-26. ^ "R744.COM/ Ixetic". Archived from the original on 2012-02-22. Retrieved 2016-02-08. ^ "Valeo Press Kit" (PDF). R744.com. Archived from the original (PDF) on 2011-07-17. Retrieved 2010-12-26. ^ "Dana". Dana.mediaroom.com. Archived from the original on 2011-07-14. Retrieved 2010-12-26. ^ "Behr". Behr.de. 2009-05-20. Archived from the original on 2009-10-13. Retrieved 2010-12-26. ^ "Trams, energy saving, private cars, trolley buses, diesel buses | Claverton Group". Claverton-energy.com. 2009-05-28. Retrieved 2009-09-19. ^ "SUSTAINABLE LIGHT RAIL | Claverton Group". Claverton-energy.com. 2008-11-21. Retrieved 2009-09-19. ^ "India Plans to Sell Only Electric Cars by 2030 | NewsClick". NewsClick. 2017-06-16. Retrieved 2018-02-07. ^ "India Considers 100% Electric Vehicles By 2030 | CleanTechnica". cleantechnica.com. 2017-04-21. Retrieved 2018-02-07. ^ "EESL to procure 10,000 Electric Vehicles from TATA Motors". pib.nic.in. Retrieved 2018-02-07. ^ Balachandran, Manu. "As India revs up its grand electric vehicles plan, Tata and Mahindra are in the driver's seat". Quartz. Retrieved 2018-02-07. ^ Frederic Lambert (2017-04-14). "Nissan is heavily discounting the LEAF with special deals for just ~$13,000 ahead of next-generation". Automotive News. ^ SDG&E. "$10,000 off 2017 BMW i3". Automotive News. Archived from the original on 2017-12-01. Retrieved 2017-11-30. ^ Guy Kovner (2017-08-11). "New electric car for less than $10,000? Sonoma County makes it happen". Automotive News. ^ "U.S. Utilities Look To Electric Cars As Their Savior Amid Decline In Demand". NPR.org. Retrieved 2018-11-19. ^ The Electric Vehicle Homecharge Scheme grant is limited to one installation at a domestic residence per eligible vehicle, up to a maximum of two charge points at a single residence. OLEV also offers grants for EV chargers at work via the Workplace Charging Scheme. It offers a contribution of £500 for each chargepoint installed up to a maximum of 20 across all sites. ^ "Shibboleth Authentication Request". eds.b.ebscohost.com.offcampus.lib.washington.edu. Retrieved 2018-12-04. ^ Helena Spongenberg (2008-08-27). "EUobserver / EU states plug in to electric cars". Euobserver.com. Retrieved 2009-09-19. ^ Hans Greimel (2013-03-08). "Toyota targets solid-state batteries in '20". Automotive News. ^ "Advances in Lithium-Ion Batteries Will Make Electric Vehicles Competitive, But It Will Take a Decade - MIT Technology Review". MIT Technology Review. ^ "STAIR electrochemical battery". Epsrc.ac.uk. Archived from the original on 2010-07-09. Retrieved 2010-12-26. ^ Corporate, Renault Trucks. "Renault Trucks Corporate - Les communiqués : Renault Trucks, Stef et Carrefour dressent un bilan positif du Midlum 100 % électrique de 16 tonnes". corporate.renault-trucks.com (in French). Retrieved 2018-11-29. ^ Corporate, Renault Trucks. 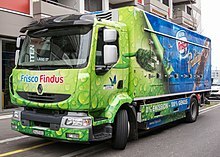 "Renault Trucks Corporate - Les communiqués : Un camion frigorifique 100 % électrique pour Nestlé Suisse". corporate.renault-trucks.com (in French). Retrieved 2018-11-29. ^ Hoffmann, Julian (2018-09-17). "eActros startet in die Kundenerprobung: Hermes ist erster Elektro-Lkw-Kunde". Eurotransport (in German). Retrieved 2019-01-06. ^ Hoffmann, Julian (2019-01-02). "CF Electric für Jumbo: DAF E-Lkw im Praxistest". Eurotransport (in German). Retrieved 2019-01-06. ^ "Daimler Trucks livre ses premiers Fuso eCanter en Europe". www.decisionatelier.com. 2018-01-11. Retrieved 2019-01-06. ^ Martinez, Steven. "Daimler Delivers Electric eM2 Truck to Penske Truck Leasing". www.truckinginfo.com. Retrieved 2019-01-06. ^ "E-Lkw: Porsche setzt MAN eTGM in Werkslogistik ein". electrive.net (in German). 2018-12-16. Retrieved 2019-01-06. ^ L2C2. "Renault Trucks va commercialiser une gamme complète de camions électriques". www.avere-france.org. Retrieved 2018-11-29. ^ "Voici le premier camion tout électrique de Volvo Trucks". Autoplus.fr (in French). Retrieved 2018-11-29. ^ Luke John Smith (2017-11-23). "Tesla Semi truck REVEALED: EV has 500 miles of range and goes 0-60mph in five seconds". Automotive News. ^ a b France-Presse, Agence (2018-09-17). "Germany launches world's first hydrogen-powered train". the Guardian. Retrieved 2018-11-29. ^ "L'Occitanie, première région à commander des trains à hydrogène à Alstom". France 3 Occitanie (in French). Retrieved 2018-11-29. ^ "La constructora Alstom quiere ir por el 'tramo ecológico' del Tren Maya". El Financiero (in Spanish). Retrieved 2018-11-29. ^ "SNCF : Pépy envisage la fin des trains diesel et l'arrivée de l'hydrogène en 2035". La Tribune (in French). Retrieved 2018-11-29. Cefo, Nevres (2009). Two Cents Per Mile: Will President Obama Make It Happen With the Stroke of a Pen? (1st ed.). Frederick, MD: Nevlin. ISBN 978-0-615-29391-2.
International Energy Agency (May 2013), Hybrid and Electric Vehicles - The Electric Drive Gains Traction. Leitman, Seth; Brant, Bob (2008). Build Your Own Electric Vehicle (2nd ed.). Boston: McGraw-Hill, Inc. ISBN 978-0-07-154373-6. Wikimedia Commons has media related to Electrically powered vehicles. Alternative Fueling Station Locator, charging stations (EERE).